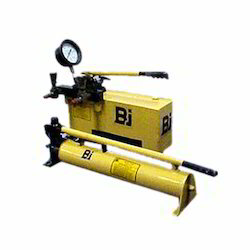 In a short span of time, we have become a reliable provider of a wide range of Hydraulic Hand Pump. These hand pumps are made using high grades mild steel material which is obtained from reliable vendors of the industry. Our offered range of pumps consists of collapsible handle to deal with low pressure and is best known for heavy duty construction. Our range of hand pump is best known for attributes such as precise finish, low maintenance & durable.